Most people want a kitchen that is visually appealing, practical and easy to work in. The curtains are significant items for the beauty of kitchen and should meet practical requirements. If you are looking for curtains near working surface, tie-backs are desirable to keep the curtains away from the flammable things and to maximize light. You should make perfect coordination of your curtains with cabinets and countertops. Always choose right kitchen curtain that will express your style. You should remember certain things while choosing curtains for your kitchen. 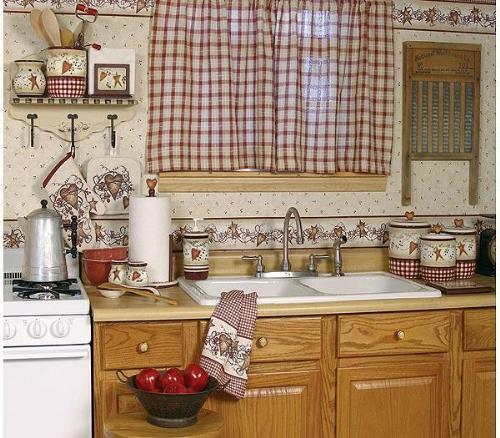 Several fabrics are available for kitchen curtains. Some are of heavy material while others of light material. Heavy fabric curtains are not suitable for your kitchen as they block air and light. They trap cooking odors and make your kitchen gloomy and unpleasant place to cook. If you use choose light curtains such as lace, sheers, or cotton, they will make your kitchen appealing. Cotton curtains are the best options for your kitchen because they are durable and light weight. Also cotton curtains are easy to wash. 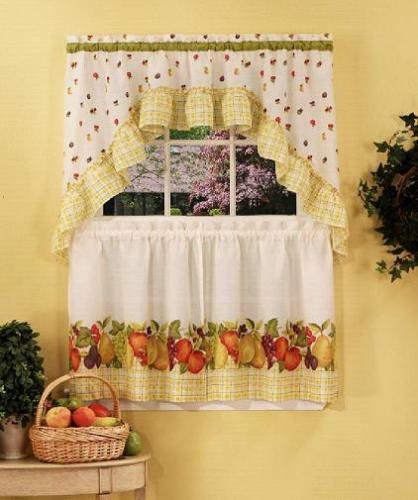 Printed and embroidered designs of kitchen curtains make your kitchen look highly elegant. One thing you have to remember is to match curtains with furniture. Color of curtains significantly alters overall look of your kitchen. 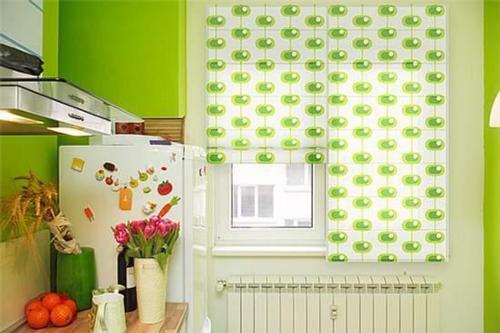 Choose right color for curtains in your kitchen. Give illusion of larger kitchen with light color curtains. 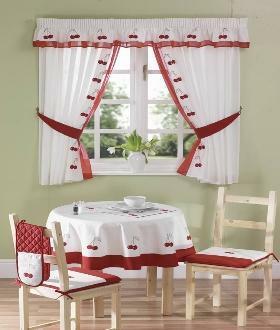 Match curtains with kitchen furnishing and walls for cheerful look. You can also use complementary colors for contrast. Length is a significant factor for kitchen curtains. Excessive long curtains are not suitable for kitchen windows. Short curtains offer a comfy mood. Always measure your window before you go to install curtains. There are different styles of windows in your kitchen. They may be small or large. 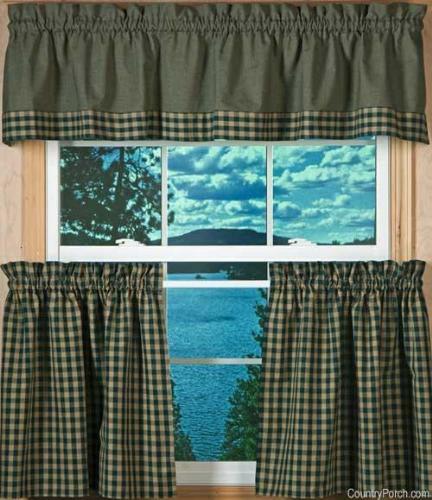 According to your windows, kitchen curtains are of different styles. For larger windows, you can install long sheer curtains to the left and the right side of the window. 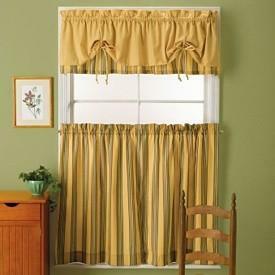 For smaller windows, you can use small pleated curtains to cover upper and lower part of the window. 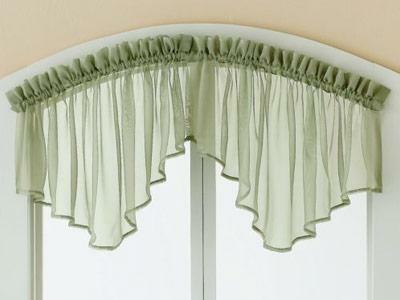 If you want to cover a small part of your kitchen window, use valance on upper portion. This arrangement will penetrate large amount of light into your kitchen making it inviting and warm. Most popular styles are country style, contemporary or classic. You can choose right one for your kitchen according to your kitchen design. 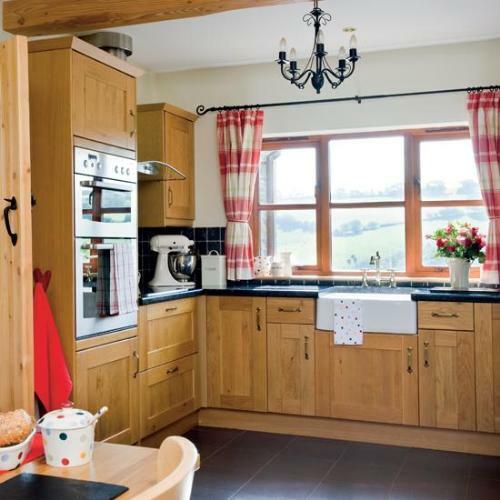 The most common style is country style which adds warmth and comfort to the kitchen. 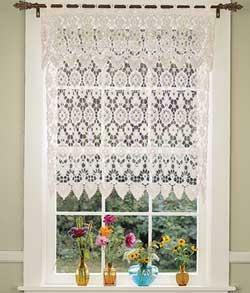 Country style curtains can be hung from top rod or in the middle of window with matching valance. • Remove hard water stains from kitchen curtains by soaking them in vinegar solution separately. • Clean your kitchen curtains properly. • Use label instructions while washing or dry cleaning curtains. • Laced curtains should be hand washed.